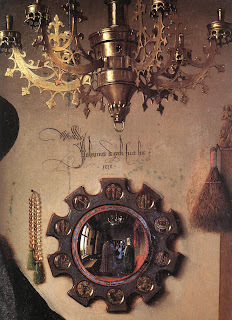 Alberti's Window: Mrs. Arnolfini Might Be Dead! Anyhow, I think Koster's argument is fascinating for several reasons. First of all, Koster reveals an archival discovery that Giovanni di Nicolao's wife, Costanza Trenta, was dead by 1433 (a year before the Arnolfini Portrait was dated!). 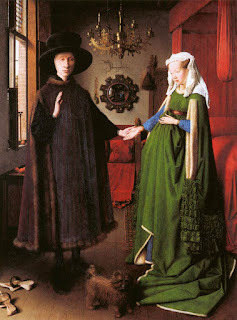 And from what we know, Giovanni di Nicolao Arnolfini never remarried. So, what does this mean? Koster convincingly argues that this portrait is a posthumous representation of Costanza, a way to remember and commemorate Giovanni's wife. The oath gesture by Arnolfini could reference an wedding oath already taken, perhaps suggesting a renewal of Arnolfini's wedding vows and devotion to his deceased wife. First of all, the idealized depiction of Costanza stands in stark contrast to the very naturalistic and individualized depiction of Giovanni, which could indicate that these two individuals are separated by life and death. Furthermore, there are other aspects in the painting which allude to death. The roundels circulating the mirror frame (see right) are scenes from the Passion of Christ. All of the scenes which show Christ alive are on the left side of the mirror (near Giovanni), whereas all of the scenes alluding to Christ's death or resurrection are closest to Costanza. Additionally, the lit candle is placed near Giovanni, whereas the snuffed-out candle is placed over Costanza. The colors of Costanza and Giovanni's garments could also symbolically allude to their present situation. Costanza is wearing a dress of blue and green: blue was a symbol of faithfulness and green was a symbol of love. Giovanni's darker clothing can be interpreted as a symbol of mourning or suffering (and Koster further points out that this work was painted before black clothing became fashionable for the Burgundian court). If you'd like to see Koster explain aspects of her argument, check out the beginning of the "Part 5" section for this documentary. (This documentary on Northern Renaissance art is hosted by Joseph Koerner, another art historian who happens to be Margaret L. Koster's husband!). What do people think of this argument by Koster? On a side note, I have to say that I'm always surprised when practicing scholars still refer to this painting as a wedding portrait. That Panofskian approach has been questioned by Northern Renaissance scholars for several decades, and even the National Gallery (which houses this painting) shies away from the wedding interpretation. In fact, I thought the wedding debate was settled in 1993 by Margaret D. Carroll, who pointed out that Mrs. Arnolfini is wearing a headdress traditionally reserved for married women.3 Argh. Despite all of the respect that Panofsky deserves, I really feel like we need to stop interpreting this piece as a wedding portrait. Let's get on with our lives, folks. 1 Margaret L. Koster, "The Arnolfini Double Portrait: A Simple Solution," in Apollo (Sept. 2003): 3-14. Text available online here. 3 Margaret D. Carroll, "In the Name of God and Profit: Jan van Eyck's Arnolfini Portrait," Representations 44 (Autumn 1993): 100-101.